You will find four subjects, each part has 50 questions. There are also answer keys of all questions and complete solutions of the questions specially quantitative aptitude, reasoning. If you like this practice set, don't forget to give feedback here as comments! 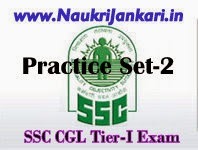 0 comments for " Download SSC CGL Tier-I Model Question Paper (Set-2) "